So just the other day I was making a list of three things I wanna take with if I were ever stranded on a desert island. Apart from infinite quantities of cola and food, it came down to taking a music system or Brad Pitt. 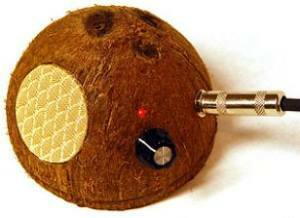 In the end I went with Brad since this cool coconut amp reassured me I wonât exactly be short of music on the remote South Pacific beach! But I was really wondering if I could get Brad to get a player with him âcause otherwise this amp will be kinda useless, donât you think? Enjoy sake with dried squid cups!